Active @ UNDELETE Freeware is a lightweight version of Active@ UNDELETE Recovery Toolkit software.The software helps you to restore your lost and deleted files and folders from live volumes (logical drives) or to recover lost files from deleted or damaged partitions. If you need more advanced features, such us recovery data from RAID's, restoring partitions, low level disk editing and much more please evaluate Professional edition. For recovering files and folders you need to scan logical drives. During the scan all deleted (and existing) file and folders will be detected. You can see the results of a logical drive scan in a separate tab views. You easy find your deleted files or files with certain file name mask, preview your files before recovery to evaluate its integrity and much more with File Filter tool. When volume scan is completed, you may filter scan results by using File Filter tool. With Scanning physical devices you can restore files from deleted or damaged partitions, detect files by their signatures and more. We live in a world which is highly dependent on our digital data, so losing important files, either by accident or by causes beyond our control, often leads to severe consequences. In many cases, data loss is down to accidental deletion, such as unwittingly emptying the Recycle Bin without checking its contents first or by deleting the wrong disk partition. In other cases, data loss may be down to other factors, such as technical failure or an attack by a hacker or some form of malicious software. If you find yourself in a situation where you have lost some of your most critical documents or other files, there is a good chance you can get everything back using Active@ UNDELETE. Active@ UNDELETE Freeware is your one-stop solution for your data recovery needs. The program has recently been updated, providing users with a completely overhauled interface which is more intuitive and feature-packed than ever. Users may even choose from a variety of color schemes to customize the look and feel of the program. All file systems native to Windows, Mac OS and Linux are supported, making this program a great choice for those who run multiple different operating systems as well. Version 9.3 comes with an improved scanning algorithm which is both faster and more effective, allowing you to quickly find recoverable data. The program's various wizard-driven interface components have also received a major overhaul in the latest version, making them even easier to use. Whether you need to recover individual files or detect deleted partitions and recover data from them, Active@ UNDELETE Freeware provides you with user-friendly wizards to help you get the job done in minimal time. You will also be able to create virtual partitions and virtual copies of UFS, HFS+, Ext2/Ext3/Ext4 file systems. The preview feature supports many types of files, including Microsoft Word documents and PDF documents. 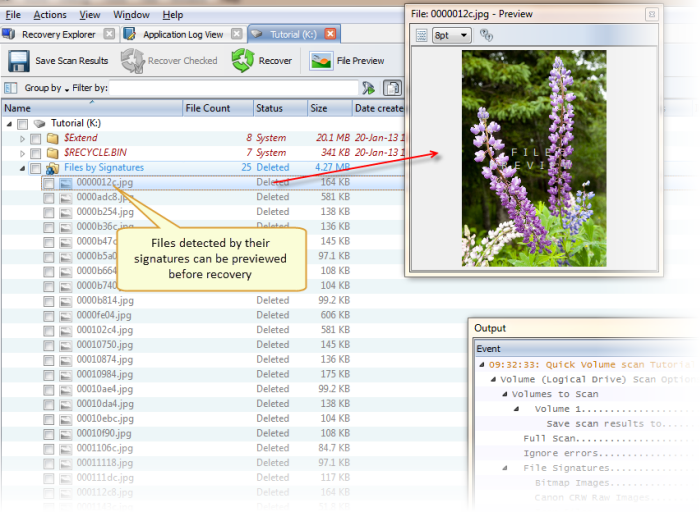 This allows you to preview files before you decide whether or not to recover them. This is an important feature in any recovery software, since things like the original file name will have disappeared upon deletion, making it difficult to find the recoverable data you are looking for. 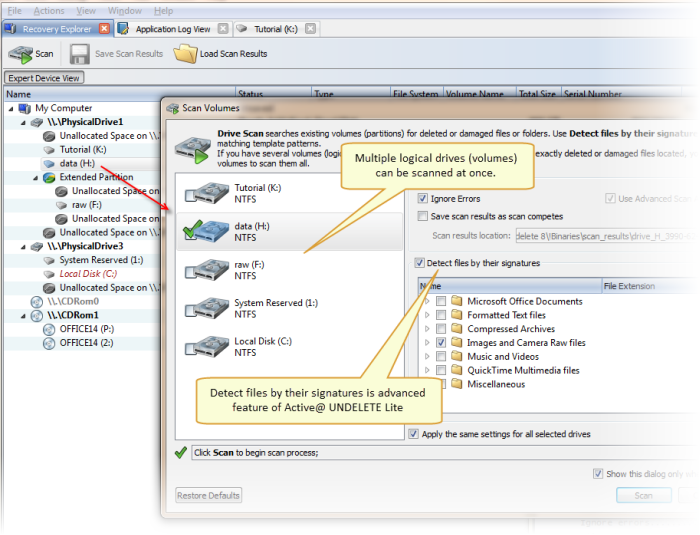 All in all, Active@ UNDELETE Freeware provides users with the best chances of successful files recovery for free. The Professional edition (Active@ UNDELETE) includes many features for more advanced users, including scripting features allowing you to create custom file signatures to search for otherwise unsupported files. If you are looking for a truly feature-packed solution for all of your data recovery requirements, then Active@ UNDELETE provides exactly what you are looking for. It includes support for both software- and hardware-based RAID setups, recovery of damaged master boot records and much more. Remastered wizards: File Recovery, Restore Partitions, Virtual RAID assembly and more!